Show your students how the rate of acceleration of an object depends on the angle of incline with this great hands-on activity. Mount the trolley on the cable, add weights with holes provided for weight hangers, and use a stopwatch to measure the time it takes for the trolley to cross. 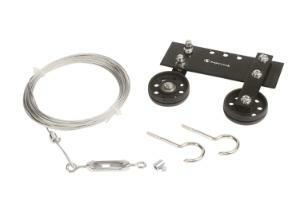 Includes: trolley with pulley, 9.1m (30 ft.) wire cable, attachment kit with hardware, and instructions.